For everyone who cajoled, begged, tried to trick my mom into telling, bribed me with cookies and got tired of waiting for me to reveal my costume………. H A P P Y H O W L O W E E N!!! Thanks mom for all the sewing!!! I’m over here mom. I’m playing with the huge Chia Pet on the lawn. 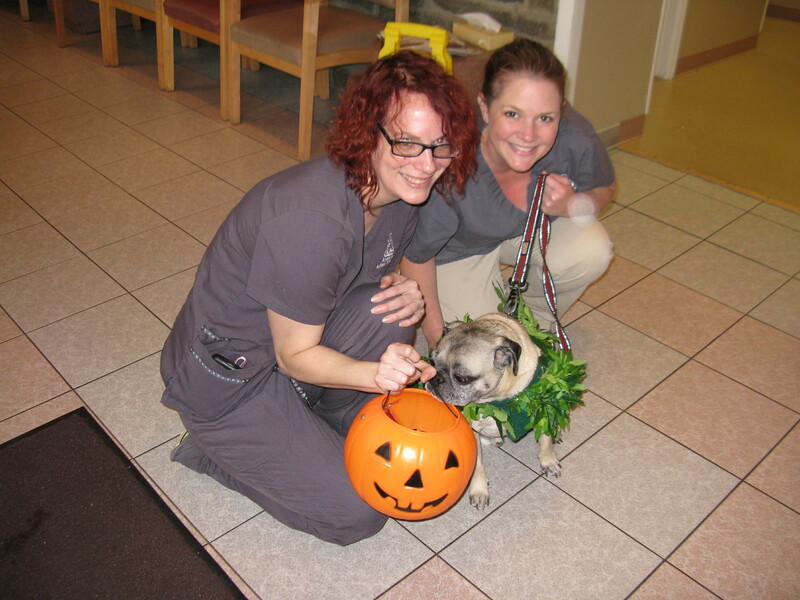 Trick or Treating with Colleen and Erika at Ardmore Animal Hospital. Just one more treat mom PLEEEEEASE. I promise I won’t get my head stuck in the pumpkin! Hi everyone! 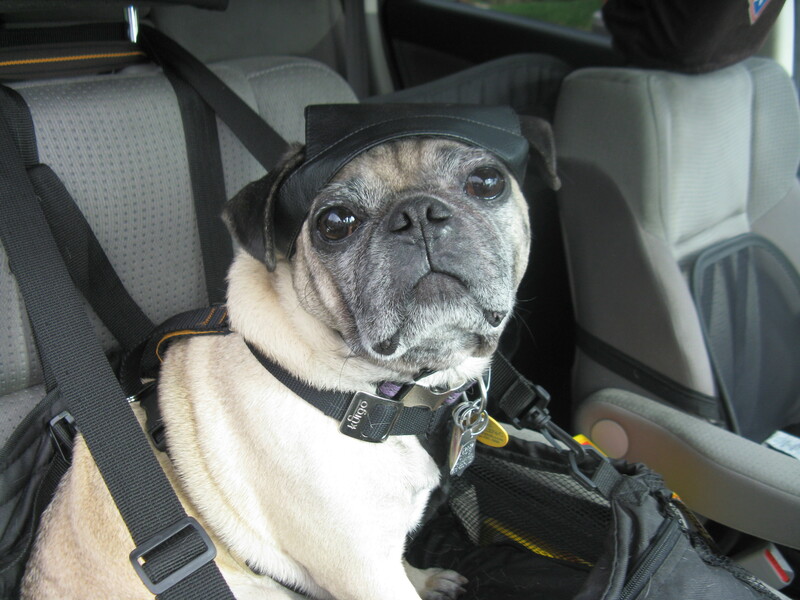 It’s me, your favorite pug and co-pilot, reporting in about my wonderful weekend in the mountains. Whaddya mean who is it? Was that you who asked that question Bentley Brodey? You’re not funny. We arrived in Springfield, MA right on-schedule, thank you very much. The same thing happens every time I check into a hotel. The front desk staff wants me to stay and work with them. I love greeting all the people. Mom said it was time for dinner so I ran to the elevator. Work would have to wait. I have my priorities, you know. There were two kids across the hall from our room the size of small ponies. Their moms wouldn’t let me ride them up and down the hall. That wasn’t very neighborly. I don’t think any of our moms liked that we talked to each other throughout the night. Who needs sleep when you’re on vacation? Whaddya mean we can’t get the ballgame on TV? 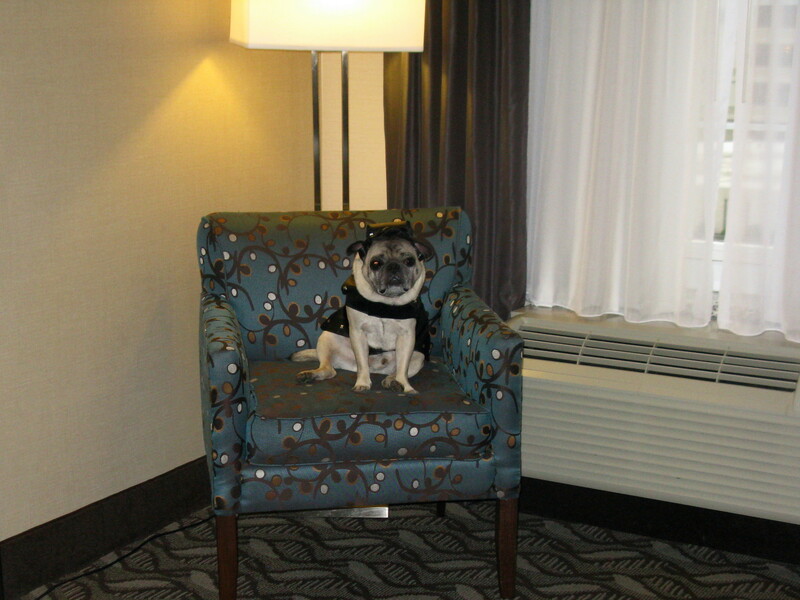 Does this chair clash with my biker outfit mom? 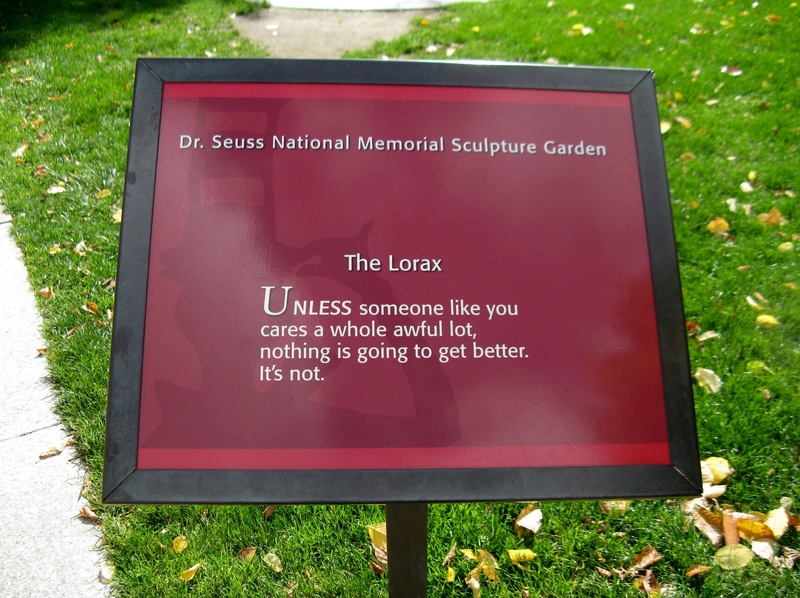 Mom took me to the Dr. Seuss National Memorial Sculpture Garden. We saw the Lorax, Horton, Thing 1 and Thing 2 (just like mom and me. I’m Thing 2 by the way. 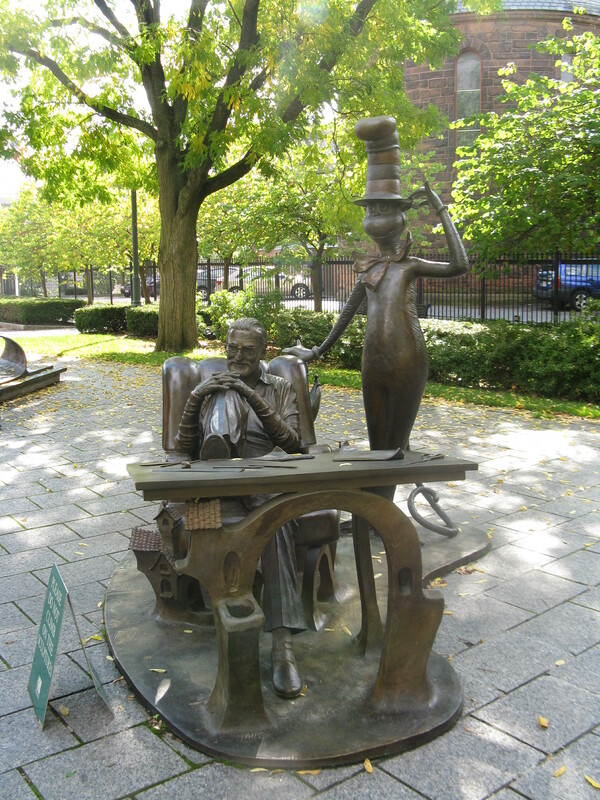 ), The Cat in the Hat, Sam (Oooh I love green eggs and ham too Sam-I-am! ), The Grinch and Max (Where was Cindy-Lou Who? 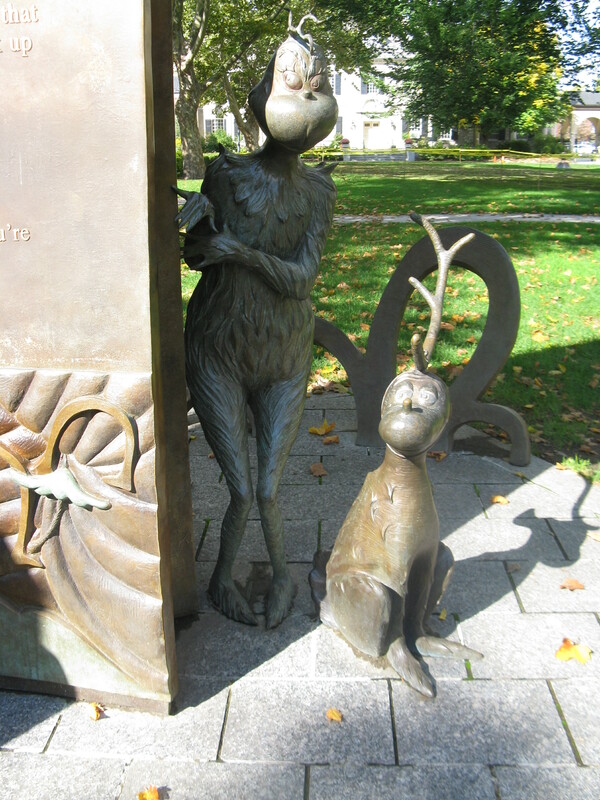 ), Thidwick and Yertle. 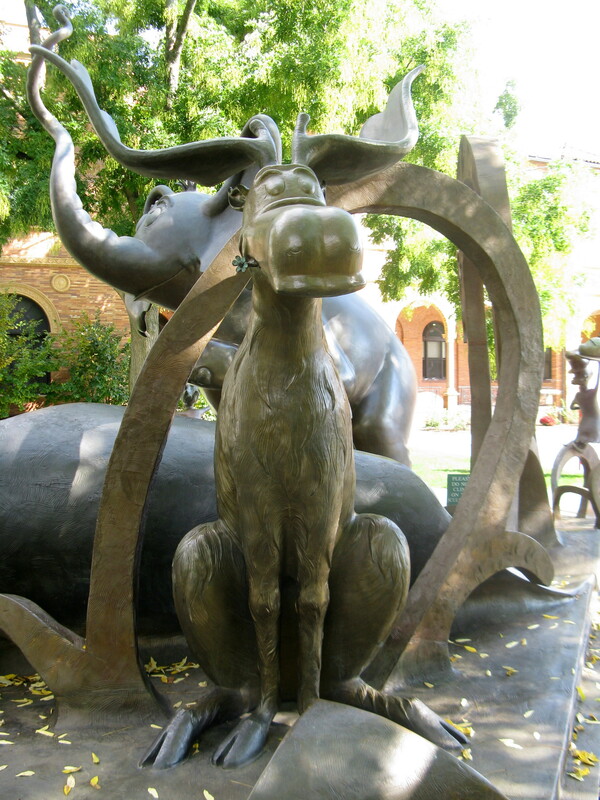 Cousin Sammy, there was no Caroseussel like they have at Universal Islands of Adventure. “If I can’t find a reindeer, I’ll make one instead!” So he called his dog Max. Then he took some red thread And he tied a big horn on top of his head. 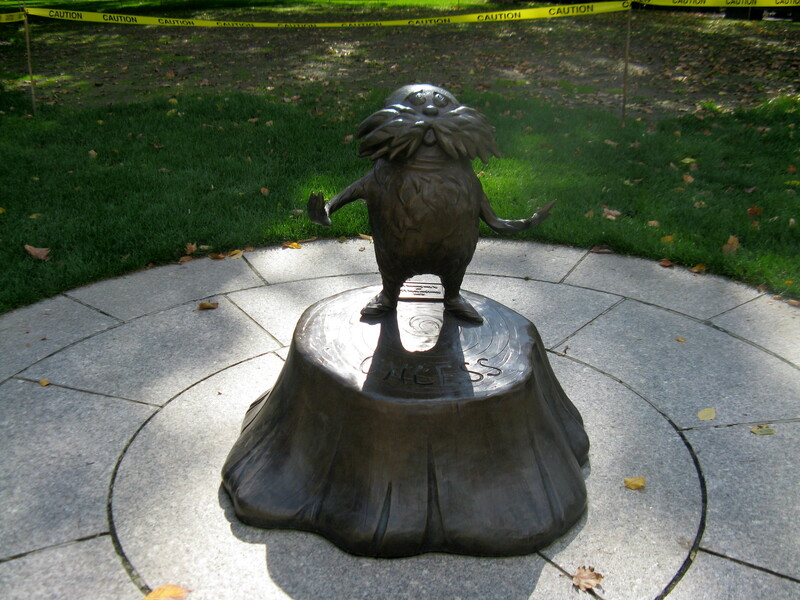 After our fun with Dr. Seuss, we drove to the Berkshires. I thought I was going to camp until mom explained that camp is in summer. Yikes! I was going to school. That’s right; my mom shipped me off to boarding school. I just knew that there would be so many New England preppy kids there. You know, kids named Kailey, Binky, Muffy Poppy, Zara, Cricket, Sabine, Teague, Paxton, Barton, Hunter, Winthorpe, Biff and Kingsley. I begged my mom to register me as Darcy. That’s right – THAT Darcy. We share so many ruggedly handsome and brooding qualities. 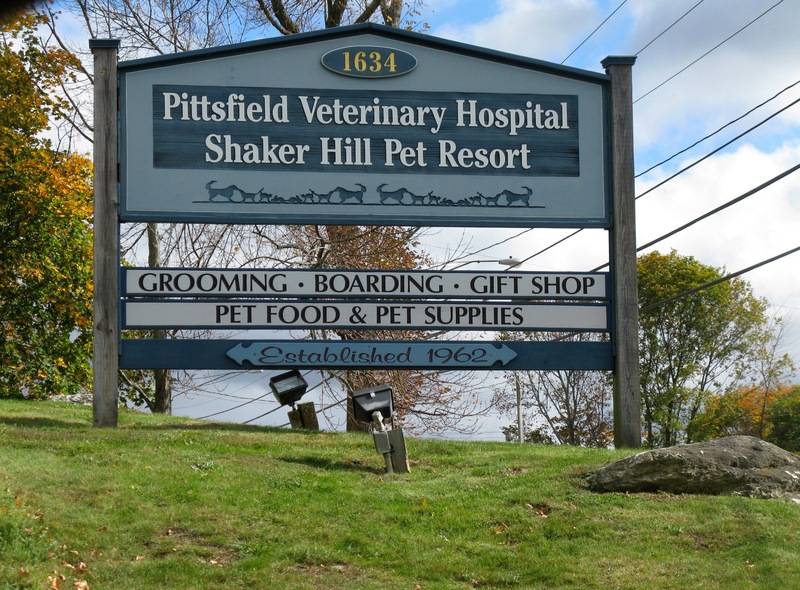 Mom dropped me off at the Shaker Hill Pet Resort. 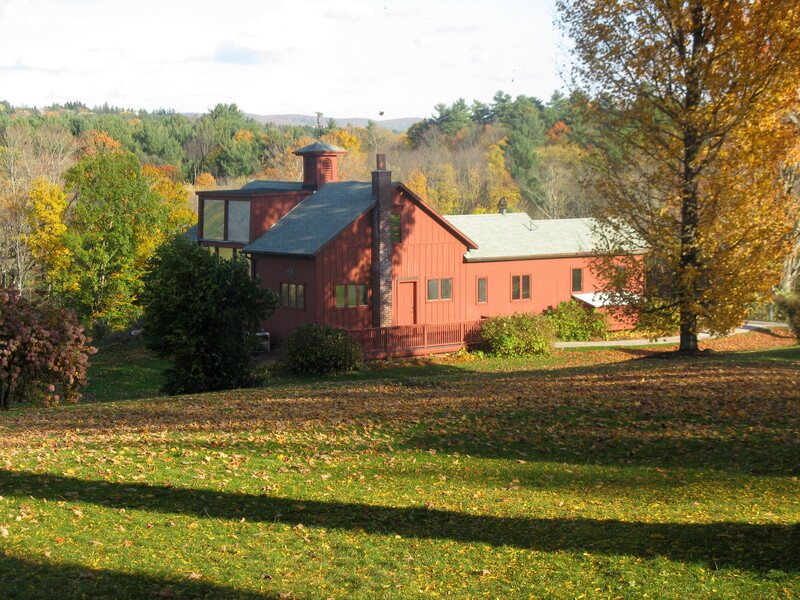 I thought I was going to a Shaking Medicine weekend with real New England Shakers, but it was not to be. My teachers thought it best to tutor me privately since I was new and only staying a few days. I checked out my room – the Large Rover Suite – and then went to math class. MATH CLASS FIRST???? At least I could have had creative writing first. I’m good at that – or so I’m told. Like my mom, I don’t understand math. I didn’t get the math gene either. The teachers kept telling me I was incorrect when I counted out the treats. “One for you, three for me, another for you, five more for me…..” I didn’t understand what was wrong so they gave me a word problem. My mom told me about those. They make her pop Ibuprofen like they’re Tic Tacs. If the bag of treats on train A leave the station at 6 am going west at 100 mph, and the treats on train B leave another station 750 miles away at 8 am going east at 70 mph, where and when do they cross? Answer: Unless I’m going to be a Conductor, who cares? My mom said that all of her teachers used to tell the class that they were preparing them for “real life.” Well, just as my mom thought, she’s been out of school for a long time and no one’s ever asked her about Train A and Train B. So why would I cross the country to find the spot where the trains meet when I could just stay home and eat the treats in my treat jar? How would I get there anyway? Is there another train, let’s call it Train C, that goes there? If I took a bus, how would I get from the bus depot to the trains? And who says there’s a train station at the point where they cross? What if they cross and keep on going? What’s the point if I can’t get the treats? And when would someone ever ask me about the trains? 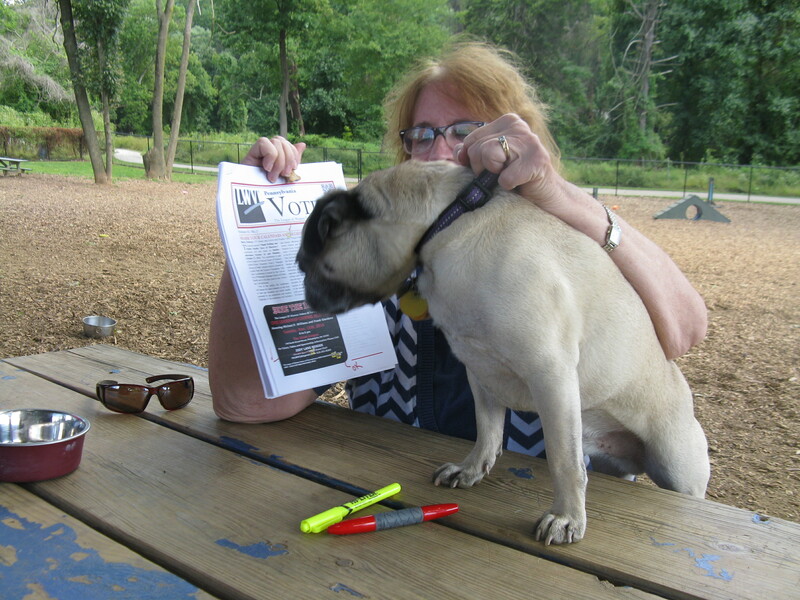 It’s not like it ever comes up in discussion at the dog park. My teachers looked like their brains were going to explode so they gave me an early recess. Mom says the same thing happens to Aunt Karen when she calculates Aunt Karen’s share of their Phillies tickets. I loved recess. We played Pin the Tail on the Squeaky Toy, Dodge Bone, Red Rover, and Pugsley Says. My teachers were wonderful and they texted mom report cards and photos each day. Now to mom’s part of our trip. 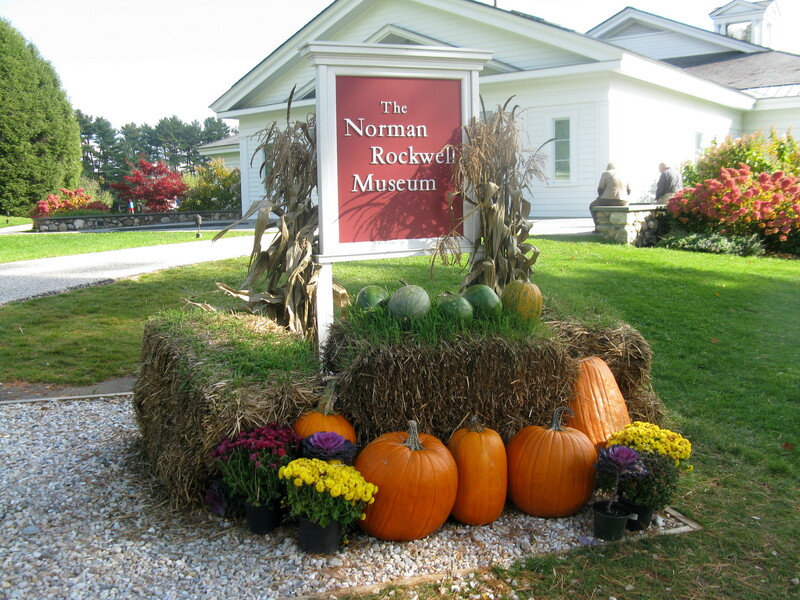 After mom dropped me off at school, she went to the Norman Rockwell Museum. She plugged in the address that the website said to use for the GPS and she ended up at someone’s house. It’s a good thing that Google Maps on mom’s phone knew the correct route. Google knows EVERYTHING! 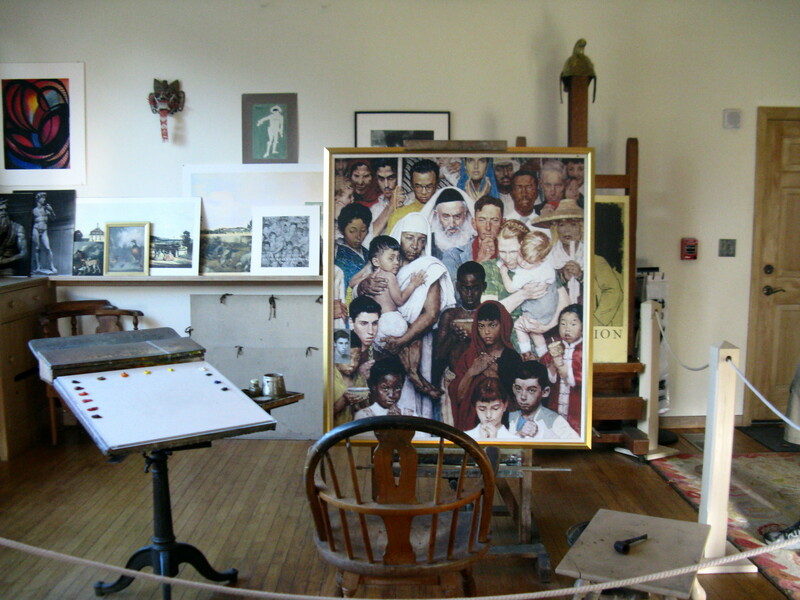 Mom said she gained quite an appreciation for Norman Rockwell’s artwork after listening to the docent’s talk. Mom has always had her favorites (Waiting for the Vet, The Runaway, Bottom of the Sixth, The Prom Dress) and it was nice to see all of them displayed. Mom then set out for her weekend at the Kripalu Center. The mountains must have been too much for the GPS because it crashed so mom used Google again, which led her up a windy mountain path to a dead-end in someone’s driveway. I guess Google doesn’t know everything afterall. Kripalu was pretty much across the street from Tanglewood, which if mom had known, would have made her travels much easier. Hey mom, see what happens when you dump your co-pilot at school! 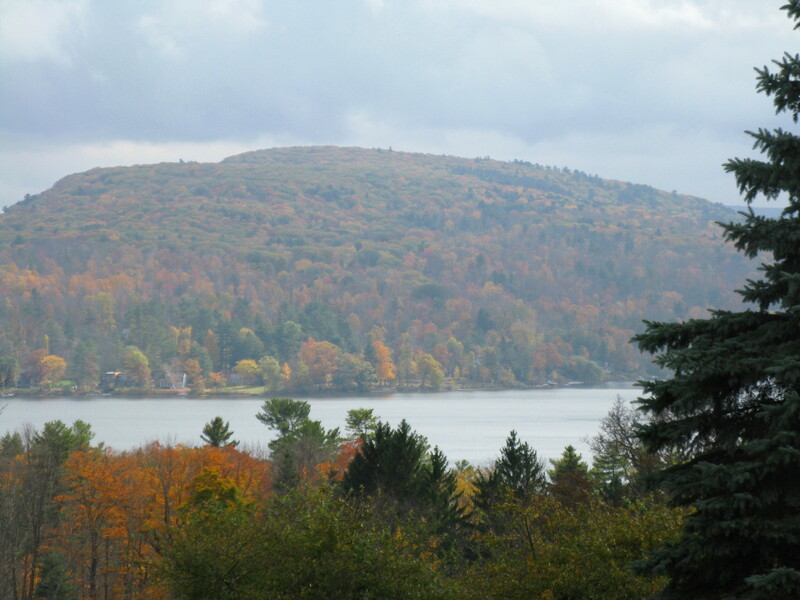 Mom went to Kripalu to take a workshop led by Beth Weinstock and Jane Shure of the Resilience Group. They were awesome and so was the workshop. 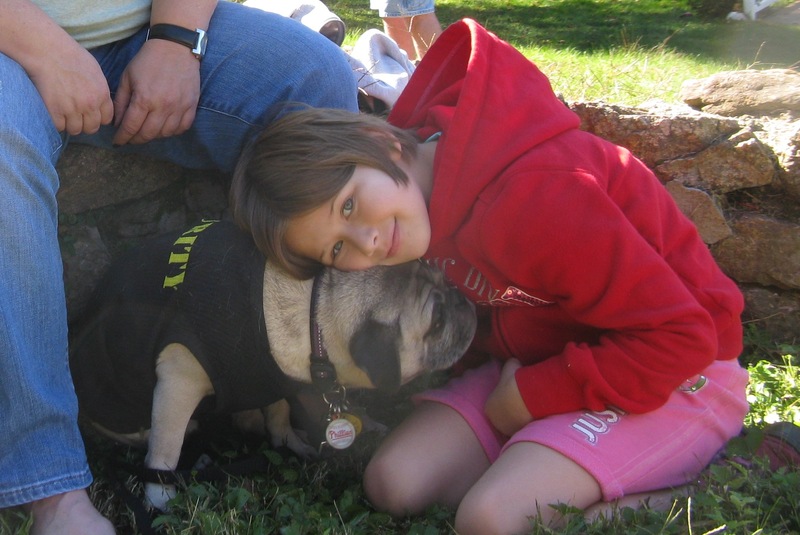 She met so many nice people: EJ; Esther; Nicole; Laurel; Kate; who has a pug named Charlotte; Ben; and so many others whose names mom forgets. Her roommate Kristine was soooooo nice and fun. 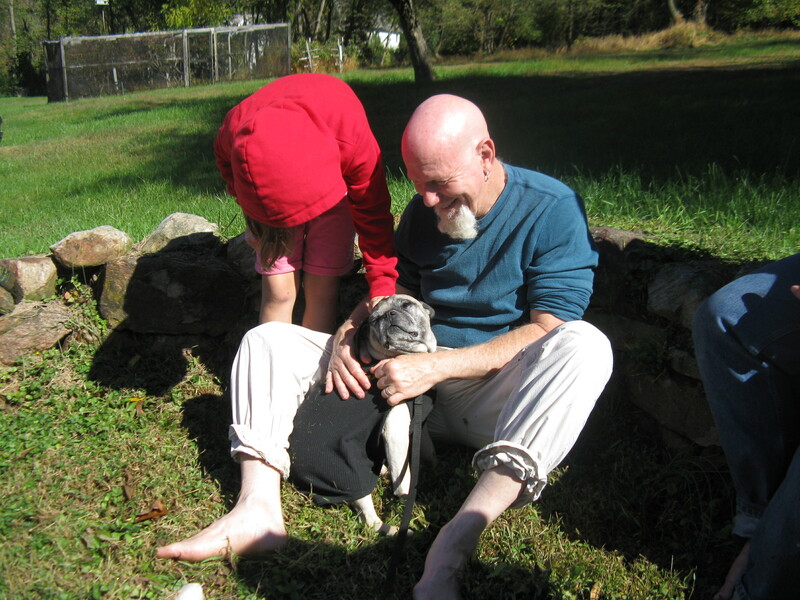 Kristine was at Kripalu to attend a workshop with the poet David Whyte. All the ladies were fainting over him. He had a book signing Saturday afternoon and the wait in line was about two hours long. Hi Miss Kristine. Thank you for helping my mom sew my Howloween costume. It’s a good thing you had your pajamas mom! The staff at the front desk said there were 40 people ahead of mom that morning who did the same thing. I think the orientation leader jinxed everybody. Mom said her schedule only allowed time for one yoga class, which was fine because the grounds were so beautiful that she spent a lot of time outside. I was so excited to see mom on Sunday when it was time to go home. When we passed the exit for the Catskulls, I covered my eyes in case the skulls were near the highway. When we passed the exit for Woodbury Commons, mom covered her eyes, which wasn’t cool since she was driving. I love traveling with my mom. I’m very good company except when I’m shrieking. I must be a speed demon. I’m fine if we’re going 60 mph or faster, but in stop and go traffic, I can be pretty unruly. I don’t know why. I wonder if Kripalu has a workshop for that. 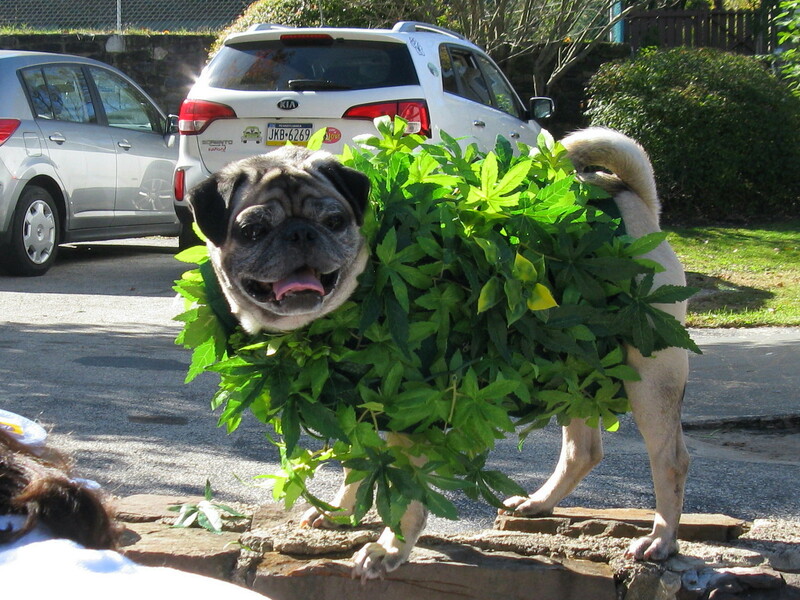 Next up……my annual Howloween costume reveal. Stay tuned! 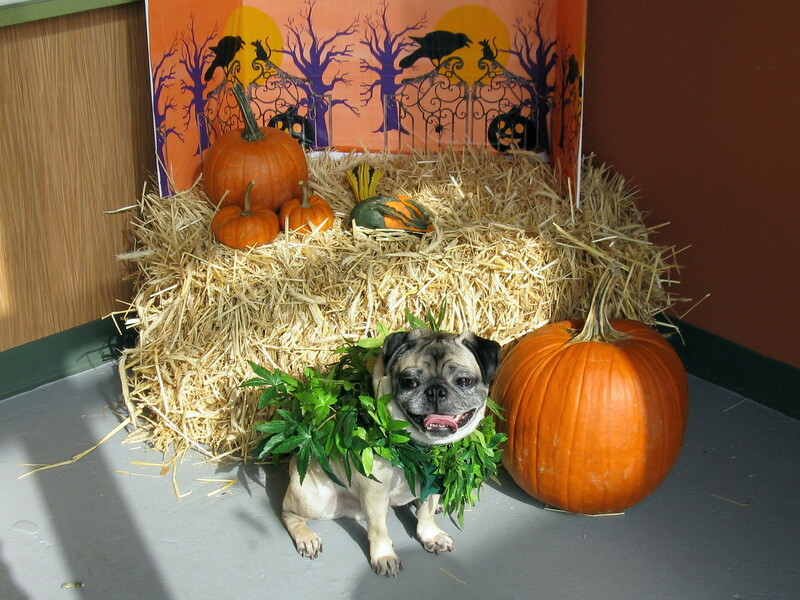 Ohm……..My Autumn Adventures – Hey, Who Put Those Cat Skulls There??? Hi everybody. Guess what? My mom is taking a workshop and I get to go with her. It’s being held at a big yoga retreat center so I’ve begun practicing my downward dog. I almost have it mastered; I just have to remember not to lie down and nap. The yoga place is in the mountains. My mom didn’t say which ones so I have to guess. All she said was that the place is north of us, which is a good thing because I’ve already been to lots of mountains in the south. There were the Blue Ridgebacks in Virginia, the Smokey Bears in Tennessee and the Quackcheetahs in Barkansas. Cackle – Who named these mountains? Everyone knows cheetahs don’t quack. I thought we were in the Aardvarks, but they were northwest of Hot Springs where we were. Okay, so I pulled out my Atlas. Yes, I still use one of those because it shows you EVERYTHING and you don’t have to squint and scroll and zoom in and out to see the screen. The closest mountains to us are the Pokeyournose. That’s where they have the places with the 7-foot Champagne Glass whirlpool bath-for-two with celestial ceiling; cozy log-burning fireplace; and the glass-enclosed, heated heart-shaped pool. My mom didn’t say that I could invite a lady friend and sitting in the champagne glass by myself would be a waste of such romantic surroundings. So nope, we’re not going there. Let me just bookmark that page for future reference when I have a date. YIKES! There are mountains made of cat skulls?!? They’re called, well, the Catskulls. Oh I don’t know about that place. That sounds kind of scary. It sounds haunted….or worse. As soon as I’m finished posting this, I’m going to send Governor Cuomo an email putting him on alert that this kind of thing is unacceptable. I plan to get enough signatures on a petition to exorcize the skulls and rename those mountains to something more appropriate, like The Pugsleys. What mom? I don’t care if people wear belts and eat borscht there! That’s a dumb thing to do in the middle of disembodied cat heads. I don’t even know what borscht is. It sounds like something that would give me toxic gas. I had that once. OMG! Mom went hightailing it out of the house and even I couldn’t stand to be with me. There wasn’t a spray, oil, candle, wax melt or Plug-In created that could make the air smell cottony fresh or like lavender fields. And besides, I don’t have a belt. I heard that you can’t eat Borscht unless you wear a Borscht belt. Why would I need any kind of belt? I don’t wear pants! 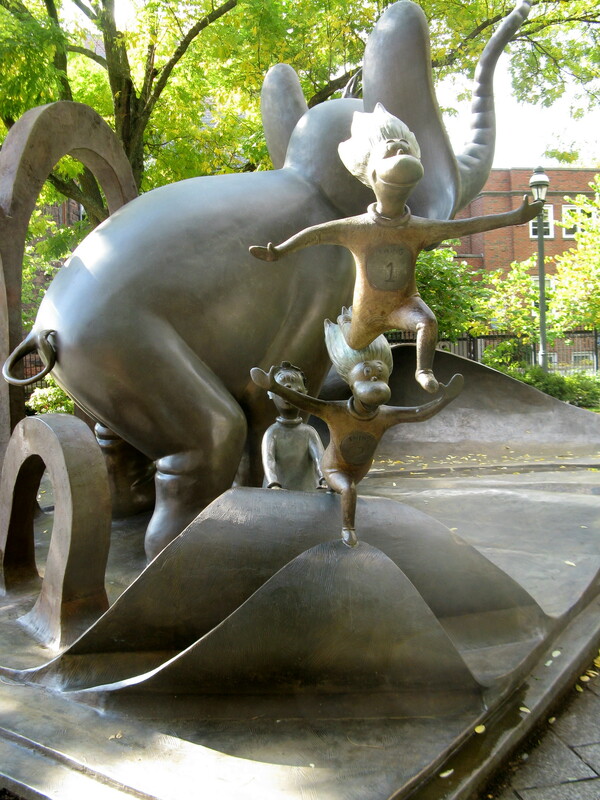 Well, sure, I wear the “pants” in my family……. Nothing mom. I didn’t say anything. What did you say about the Catskulls? Oh right mom, I remember watching that movie with you. There are the Adironducks. I wonder what there is to do there. The ducks should move to the Quackcheetahs. Giggle snort. Oh wait, NOW I see which mountains we must be visiting……..THE BARKSHEERS. That’s more like it. I hope they’re not too sheer. Maybe they’re invisible. How will we find them? Mom said that we can watch the pretty leaves turn autumn colors. Does anyone know if leaves change color faster than grass grows? 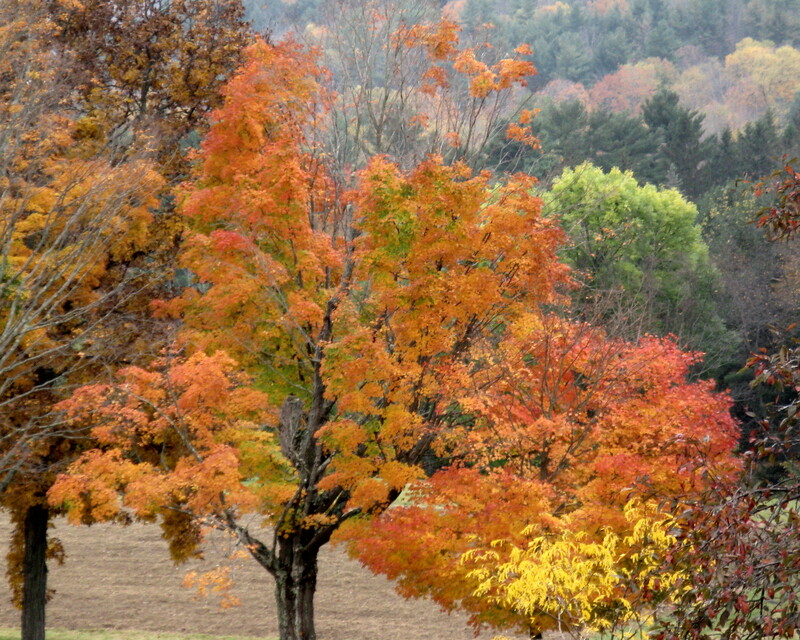 I hope there are already lots of red, orange and yellow crunchy piles of leaves in which to jump between yoga classes. The other really fun thing I did last weekend was a labyrinth walk at Sacred Journeys. My new band uniform arrived just in time for me to try it. Unfortunately, it wasn’t a ticketed event, nor did they have an RSVP list. And everyone lined up at the entrance so orderly and quiet. There was really nothing for me to do. Miss Carrie and Mr. Joel sent me the wrong size uniform. It was a smidge too long and I found out the hard way when I tinkled on it. I’ll have to take it to Mary, my tailor, before we go on the road. The labyrinth took about 30 minutes to complete. I walked it with my mom. I stayed between the rocks (for the most part) and when people passed me, they sometimes gave me a little love tap on my head. Aunt Shari bestowed blessings on our hearts as we exited, including mine. She touched me on the head and the blessing went straight to my heart. At first I didn’t feel any spiritual effects, and let’s just say that when I got home I slept for two days. It was like getting Aunt Elly’s Healing Touch on steroids. 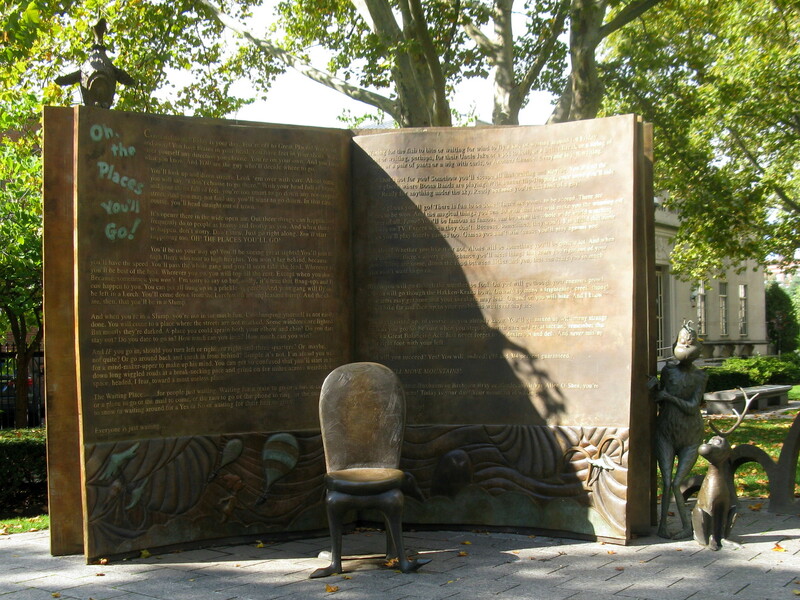 As people completed the walk, they gathered in the Crystal Garden or by the fountain. Uncle Jonathan, I can hardly keep my eyes open. I’m zausted from walking. A half-mile is far with my itty bitty legs. I met a new friend, Annie, who snuggled with me a lot. She’s so adorable and sweet. I deputized her so now she needs a Hot Glue & The Gun security uniform too. When everyone completed the labyrinth, it was time to eat. Uncle Jonathan, I told you that I’m supposed to test the food before anyone eats. It’s in my job description! Well kids, I’m not sure when we leave for our trip so I’ll keep you posted. I have to go pack now. You can never be too prepared to channel your inner puppy and crunch in a pile of autumn leaves. Hi everybody. I can’t wait to tell you all about my playdate with my Auntie Kate DeRiel. Mom drove me to Auntie Kate’s house and she made a yummy lunch for us. We had chicken salad samiches. I said chicken SALAD!!! It was boneless. Don’t worry, I asked before I dove into the bowl. I didn’t want to end up in the hospital again. There was no phone in my room and I felt very disconnected the last time. We made our samiches and Auntie Kate had all the candymints to go with them. Mom: What are candymints? Are they like Lifesavers? Mom: You mean cole slaw. 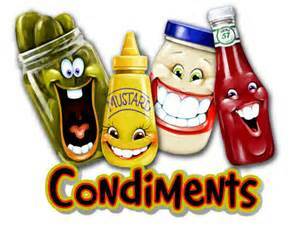 And they’re called condiments. Pugs: That’s what I said. Our candymints don’t have faces. You’re shopping in the wrong place. I like these better than ours. Anyway, best of all, we dined on Fresca. Mom: You mean al fresco. Pugs: No, I don’t. Who’s he? I don’t know this Al Fresco person. I ate with Auntie Kate. Mom: It’s not a who, it’s a what. 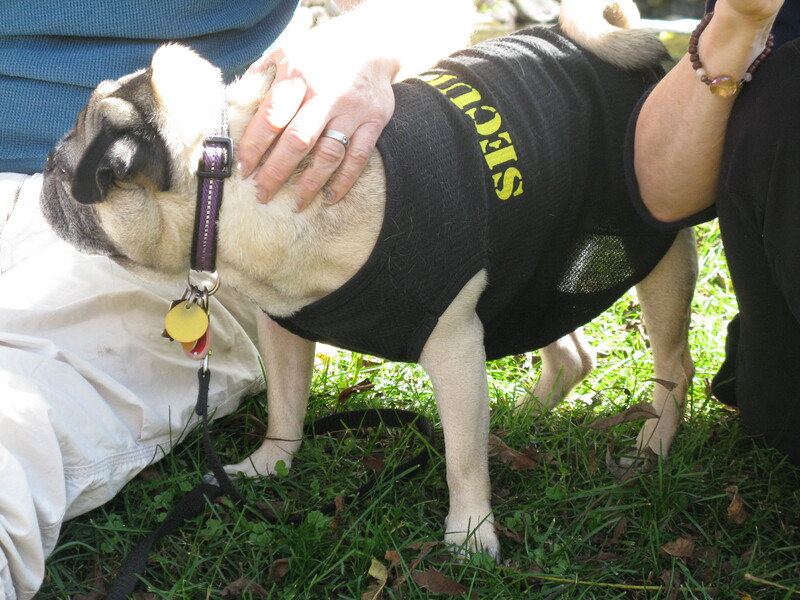 Mom: People aren’t “whats” Pugs. People are “whos”. Pugs: You just said he isn’t a who. Stop confusing me! Mom: I said it’s a what, not a who. Things are whats; people are whos. 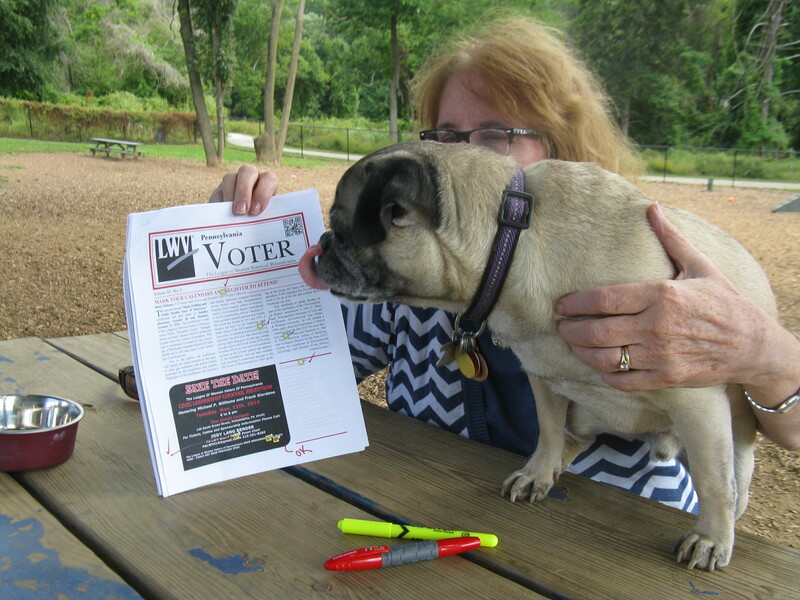 Pugs: Sigh! I hope I don’t meet anyone named Al Fresco. He must be in therapy. The way my head is spinning, I’ll be lying on a couch soon too. Mom, I don’t care who or what Al Fresco is. He, I mean “it,” wasn’t at our lunch. Wait, is Al Fresco an alien? I might care if it’s an alien. 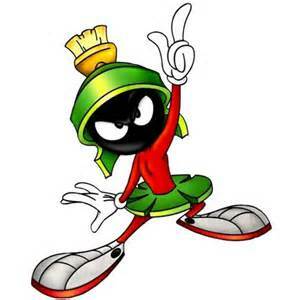 Does it know Marvin the Martian? I like Marvin. His headgear is supercool. Mom: Al fresco means outdoors. Pugs: Are you sure? I can ask Marvin. Mom: You don’t know Marvin. 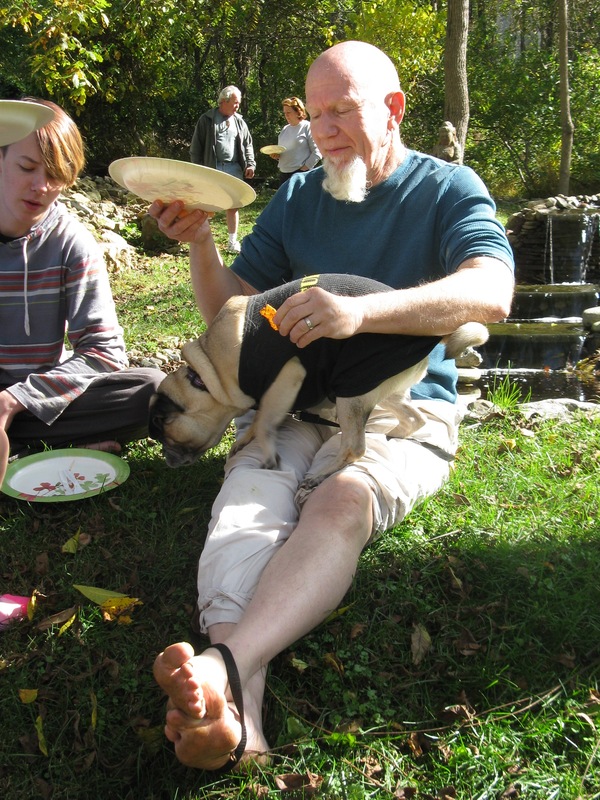 Pugs: Well, maybe Al Fresco does. Are you happy now mom? 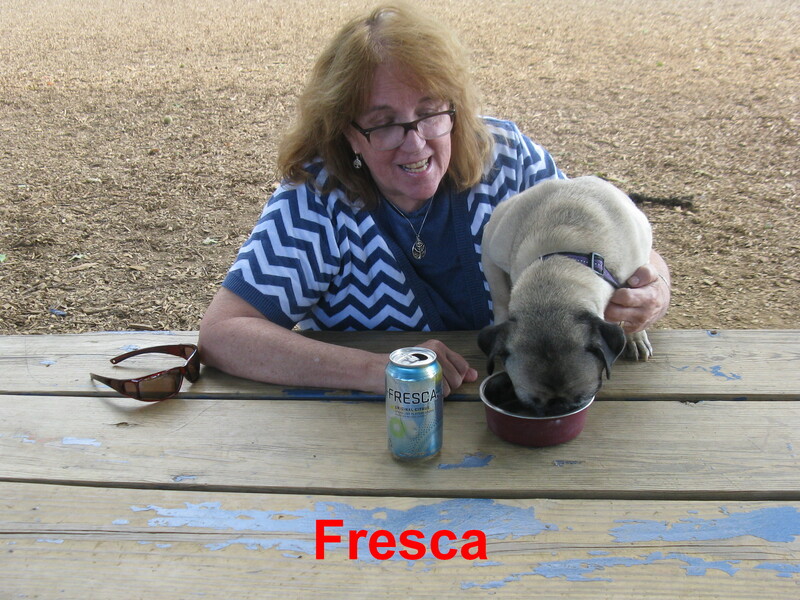 Mom: You know Pugs, your grandmother loved Fresca. She drank it all the time. I didn’t even know it was still being sold. 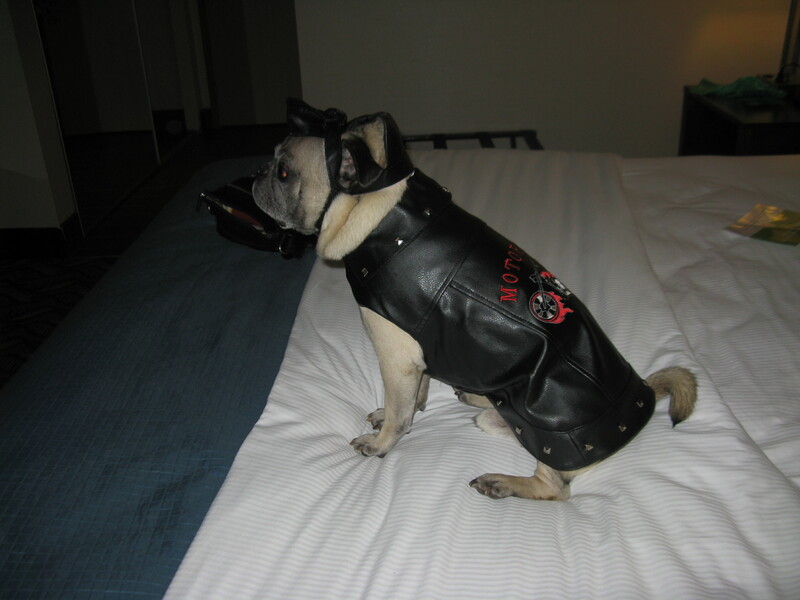 Pugs: No wonder I loved it. It must be genetic. I inherited grandmom’s Fresca gene. Mom: Uhhhh…..Ummm……..yeah, that must be it. We can go with that. 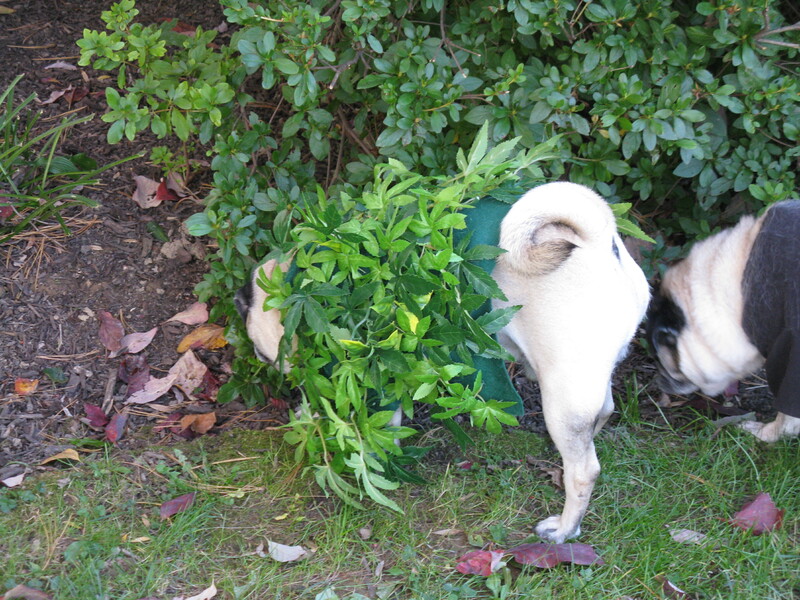 Pugs: Why did you hesitate? 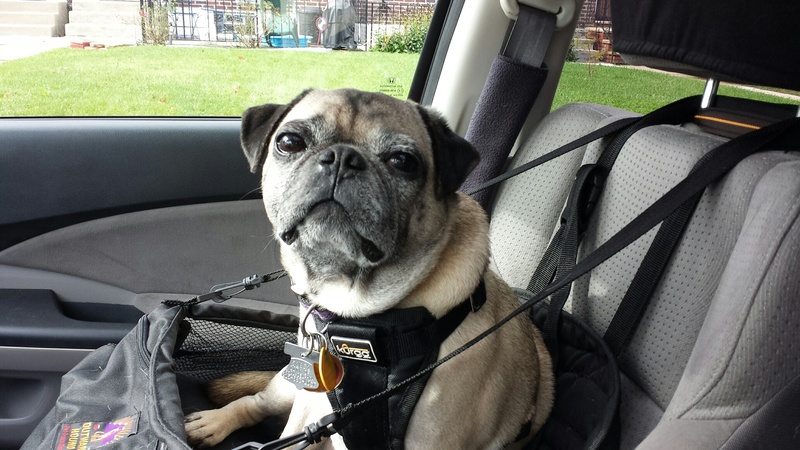 Pugs: May I continue now? Mom: Can I stop you? So when we arrived at the park, the other kids came rushing over to me and we could hardly walk through the gate. I must have wicked strong pheromones. 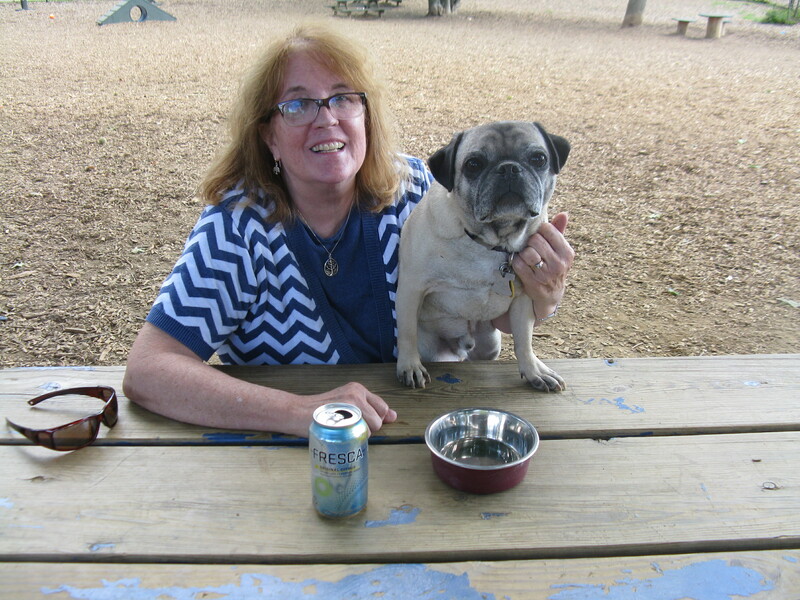 We found a pic-i-nic table and unloaded all of our gear, including some snacks for me and more Fresca. I edited mom’s newsletter for that lady group to which Auntie Kate and mom belong. I forgot my Doggles so I had to read it up close. Auntie Kate helped me. HEY THIS IS A BULLY-FREE ZONE! YOU’RE NOT ALLOWED TO EAT THE LITTLE KIDS! I finished editing the newsletter and guess what? Yellow highlighter does NOT taste like lemon. HEY, DON’T YOU SEE ME SITTING HERE WORKING? DO YOU JUMP ON TABLES AT HOME? AS A MATTER OF FACT I DO JUMP ON TABLES AT MY HOME BECAUSE THEY’RE MY TABLES. THESE AREN’T YOUR TABLES. DID YOU ALL MISS THE CLASS ABOUT SHARING AND PERSONAL SPACE? OH GROSS – WHO STEPPED IN SOMETHING FUNKY? YOU BETTER TAKE THOSE STINKY PAWS SOMEPLACE ELSE. IT’S CALLED HYGIENE. GOOGLE IT! I’m going to find a different park. Even though I liked the new agility equipment the park ranger added, I don’t like that the big kids jump on me and I really don’t like all the dirt on the ground. Mom had to wash my paws and face when I got home and I left paw prints all over the car seat. 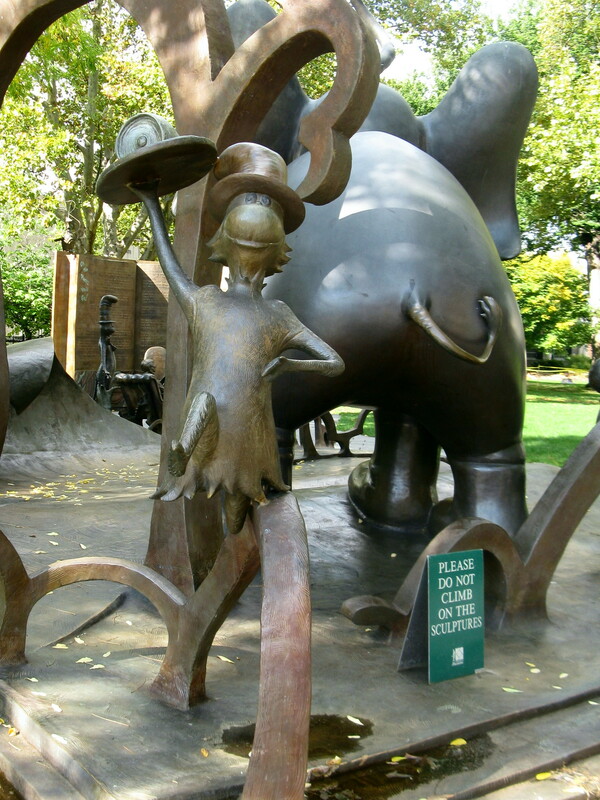 I want to find a park with grass where I can frolic and play without needing to run through the car wash afterward. You can text me with your suggestions. And if you see Al Fresco, run!